The Ejector glass bong is made from thick walled glass and is a fine piece of workmanship. Great quality, amazing design and functionality at a more than reasonable price. Available in three different colors. Ejector, designed to get the most out of the Eject-a-Bowl. 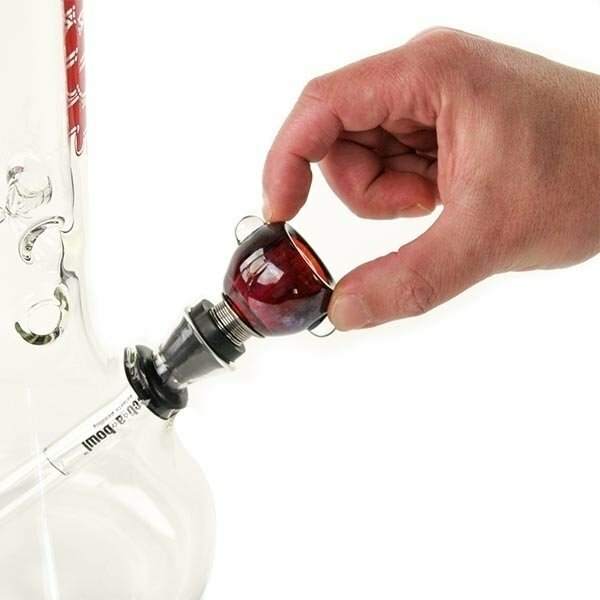 The Ejector Ice Bong is the perfect fit for the Eject-a-Bowl, without the need for an adapter. Its called Ice Bong because it is particularly suitable for the use with ice, due to the functional indentations. The Ejector Ice Bong consists of thick walled (4mm) clear borosilicate glass with contrasting colors, wherein the logo, the extra thick mouthring and the Eject-a-Bowl are colour-matched. Abailable in black, red, blue and green.